What is com.google.android.googlequicksearchbox and why is it coming up as Referral Traffic (all of a sudden) and not Organic Traffic? First off, let's research what the heck com.google.android.googlequicksearchbox actually is. From my master Googling skills I found a few forums and articles that discuss this, seemingly new, traffic source. In a short post from May 4 on Search Engine Roundtable, they note that this traffic source stems from a user on an Android device using the default Google search bar to complete a search query. The article also notes that according to the Play Store, the app was updated on April 28th. In our research here at Page One we noticed that this referral traffic began showing up in our data at that time, the 28th or after. To test this theory I opened the Referral Traffic Report, specifically looking at traffic from com.google.android.googlequicksearchbox and added a secondary dimension (I love secondary dimensions, btw!) and included "Mobile Device Marketing Name" and sure enough - all mobile phones that use Android operating systems! If you know me, you know that's still not enough information - I needed MORE! I needed to know if it was tagging both voice and text search queries similarly. For our super small test, we found that it wasn't. Google Analytics tagged the text query as Direct Traffic and the voice query as Referral Traffic. Please note here: none of the organic search queries we completed on the Android phone were actually tagged Organic Traffic. Can you see how sad my face is right now? Basically, you could see organic traffic or paid traffic drop. Don't panic! Look around, see if your referral traffic might have had an increase. Google products are always changing - like Google Analytics' removal of keyword data to protect user searches, or Google's removal of paid ads from the side of SERPs - could this be just another step to getting the masses to use their paid Enterprise solution, Google Analytics 360 Suite? This could all be a big glitch and get cleared up over the next few months or maybe this is just another line in the sand that Google is drawing between its free analytic product and the paid version. 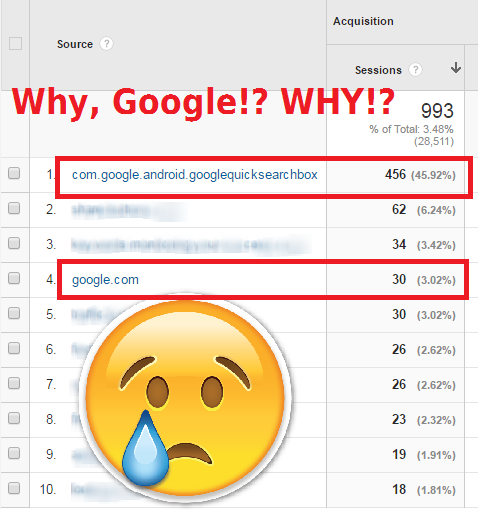 Have you seen this show up in your Google Analytics? What are your thoughts about all this? We welcome comments and discussion at the bottom of this thread!